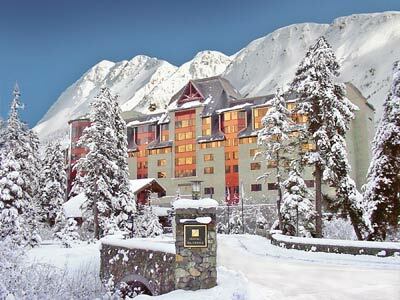 Alyeska Resort is Alaska's a premier year-round destination resort and the largest ski area in the state. Alyeska's claim to ski fame might include the only ski resort in North America with a base elevation at or near sea level, Northern Lights, or Tommy Moe the World Cup and Olympic gold medalist trained in downhill and super G at Alyeska. Alyeska boasts 9 lifts; 3,200 feet of vertical fun; 1,610 skiable acres, 76 runs, and a base elevation of 250 feet above sea level. Other mountain information can be found on the Alyeska Statistic Page on this site. The low base elevation at Alyeska means plenty of oxygen!! In mid January Alyeska has about six hour from sunrise to sunset, but offers 2,000 vertical feet of night lighting. By mid February that time span has increased to nine hours and in mid March sunrise to sunset is up to 12 hours. The ski day lasts from 10:30am to 5:30pm with night skiing until 9:30pm on Friday and Saturdays through mid-March. Skiing starts around Thanksgiving with daily operations through mid-April and weekend skiing through Memorial Day, conditions permitting. A little side note on Alyeska is from the top of the resort you an look out over the northern tip of Cook Inlet. Across the Inlet is some of the most remote land in North America. There are no roads, just volcanoes (one smoking) , bears and salmon. Alyeska is spread out between the base of the mountain near Chair 1, the Alyeska Hotel and down in the town of Girwood. The base area has a number of local restaurants that cater to the day skier. These might include the Bake Shop and Jack Sprat. To the left of the resort and on the other side of the ridgeline you will fine a second center at the Alyeska Hotel. Here you will find a much larger selection of dining opportunities, which is more upscale and costly than in town. Back in the town of Girdwood and just down the street from the Post Office is the local's favorite, Chair 5. Chair 5 has an interesting history and a long list of beer, whiskey, pizza, burgers and more. Chair 5 acts as the local sports bar and pool room. If you are looking for additional options Anchorage is only 30 minutes away. A must see is Chilkoot Charlies if you interested in the for the more rustic aspect of Anchorage. If you have time, to the south of Alyeska is the Portage Lake. The lake was cut into the rock by Portage Glacier. This glacier extends up and over the ridge Prince William Sound. Further south and you can see the Alaska's Wildlife Center. Nestled at the base of majestic Mount Alyeska is the 307 room Alyeska Prince Hotel, Alaska's only AAA four-diamond property. Conveniently located at the hotel, you will find restaurants and lounges, a fitness center, rental and repair shops, ticket window and distinctive sport and gift shops. And the Alyeska Tram and ski slopes are only steps away, making this a true ski-in/ski-out resort.